Good to see Tom Young in there. Well this is some thing. I wouldn’t read much into it. It’s a stupid team really. I mean, I like Lydiate but best all time blindside? Nah, not even close. 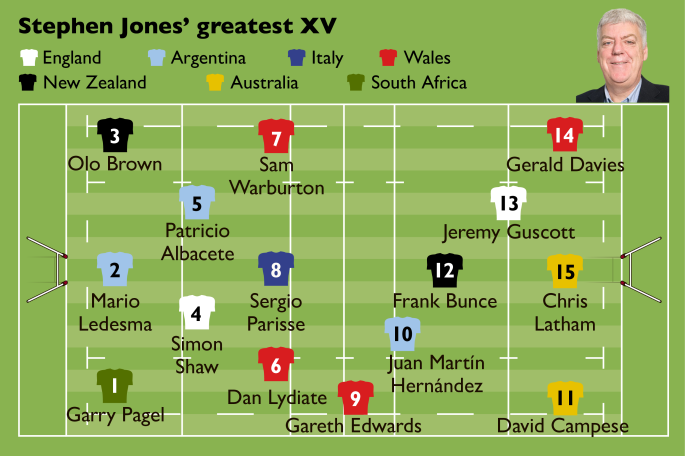 I think if you asked most pundits to do a current 15 (not all time like that one) then you’d have a good half dozen or so Irish lads in there. Do you know what. I feel like an idiot. When I first saw that team I just assumed it was Stephen Jones the ex player and didn’t realise until a week or so ago it wasn’t. It has his big silly face on it. I know, I know but I didn’t clock it at the time. Just zoomed in on the picks. Some great games in the Champions cup this weekend. Yes Sarries v Glasgow was a brilliant watch. Not optimistic about Friday. Need to win to have any chance of winning it this year. On the plus side Lawrence Dallaglio fancies us to win it and I’ve always thought he knows what he’s talking about. This weekend wins for Wales, Scotland and Ireland. If we do win it won’t be by more than 3, imo. Obviously you have to fancy Ireland in Ireland but again I don’t see them winning by more than 7-10 points so fine margins. I know Gats and Eddie had dinner recently to exchange thoughts but I didn’t realise Jones would be going full Warrenball first game in. Eddie did exactly the same at saracens. I think southern hemisphere coaches try and coach a more expansive game but then realise that british players are pretty limited and revert to a more basic approach. I don't really disagree with their assessment. I exaggerate, but don't think that's beyond reality. Apparently he has mulled over Hughes 6 Billy 8 for a while, and I bet he is itching to get Te'o and Tuilagi in the same team eventually.